After visiting the shrine in Asakusa, we decided it was time to get something to eat. Our biggest issue when travelling is finding food. Not because there never is anything good around, but we're horrible, stubborn foodies who can't just walk into any restaurant and give it a go. Look, I know this is awful, and I'm trying so hard to curb this affliction. I always feel like time is precious when travelling and you never want to waste an experience on a subpar place. That being said, Japan is honestly the best food country in the world, and I don't think you'll ever have a subpar meal there. When we arrived at the restaurant, we took a number and waited outside for a table to be freed up. It's a fairly busy spot in Asakusa on the weekend, but luckily we didn't have to wait too long. After about 20 minutes we headed inside and were seated at a large booth where we could spread out and get comfy. me over to the table and took our drink orders and quickly explained the ordering process. 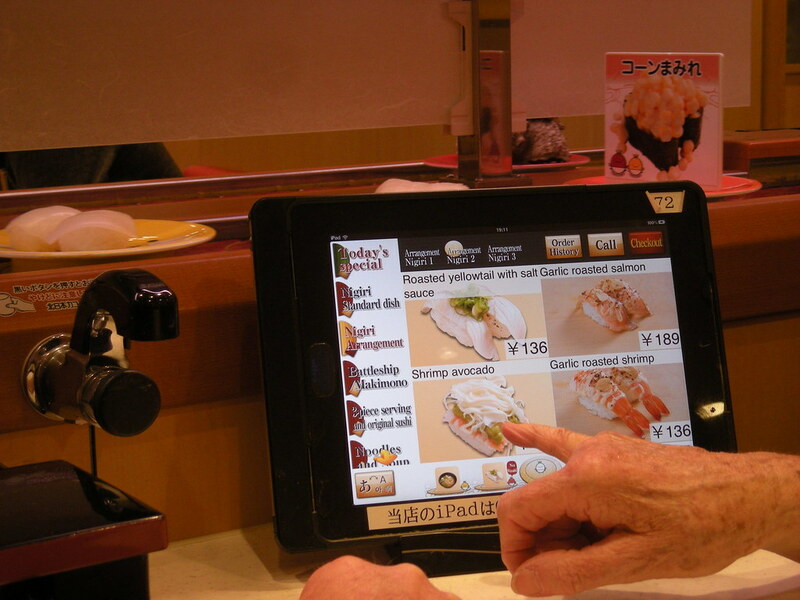 There was an iPad on the table (with an English menu) where you could select whatever sushi you wanted. 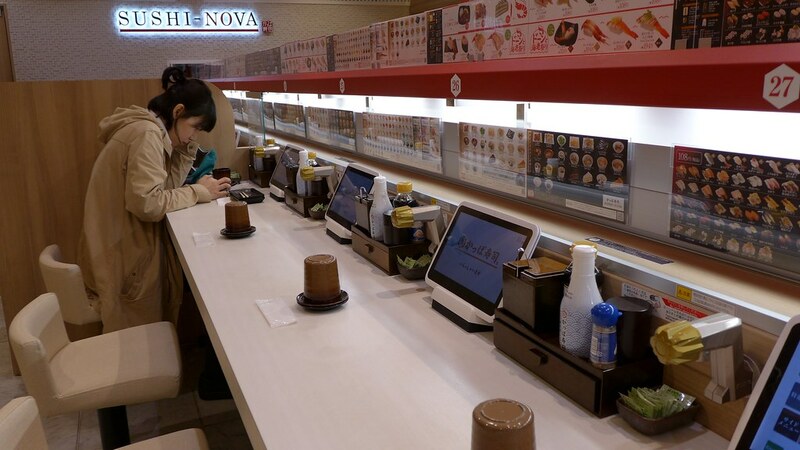 Once you placed your order, you waited a few minutes and then, out of the wall, would shoot out a tray on the conveyor belt that would arrive right to your booth! It was incredibly futuristic. You could order as much as you wanted, and even just one at a time to see what you liked and then only order more of that, or try something new. The sushi was only about 100yen per piece, and surprisingly enough, it tasted great! Obviously, it's not the best sushi in the world, but that would be too good to be true now, wouldn't it? 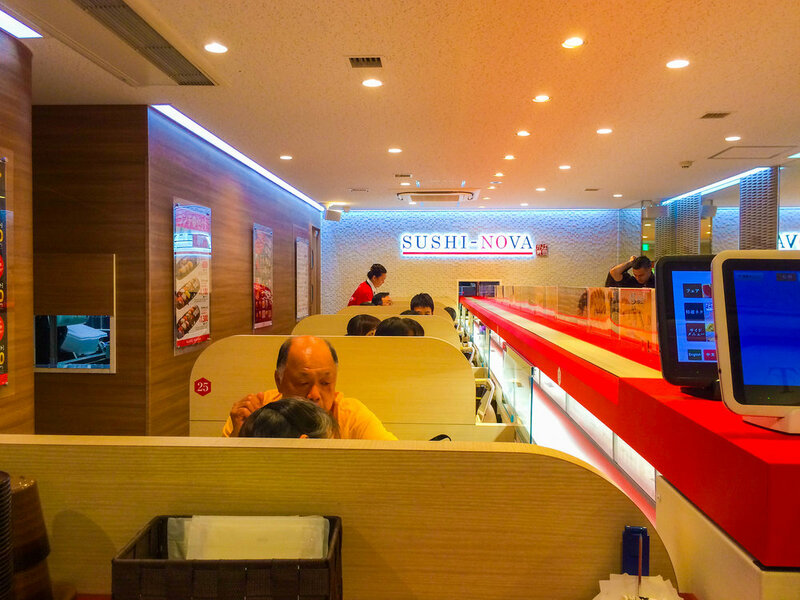 Their most popular items were the five-piece seasonal nigiri plate (650yen), the tempura platter (580yen), and the five-piece vegetarian sushi (500yen). There were over 150 different varieties of sushi to choose from as well as other dishes like soups, salads and noodles so they is definitely something for everyone. While we waited for our first order of sushi to arrive, we made our green tea. At every table, and complimentary with every meal, was a hot water tap and a little container full of finely ground green tea. All you needed to do was dump a small spoonful of the powder into your glass and fill it up with the hot water. And there you have it, unlimited green tea, right at your fingertips! Again, very common in Japan but an absolute delight to me! We didn't get too many pictures here since we were so hungry, but I did get a picture of my favourite dish. It was a three piece set of fatty tuna. Each one a slightly fatty than the next. It was heaven, and you couldn't beat the price. You can see in the video below how cute those little trays of food are when they arrive. They play a little song every time they show up at your booth. So much fun. We could have been here all day. But there was still a line outside, and we didn't want others to be waiting on our account. We took our time but once we were finished, we happily gave our table to the next excited customers.